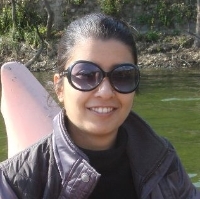 Dr Neha Joshi Raina did her Bachelors in Dental Sciences and went on to do PG Diploma in Clinical Research & Data Management. She also holds a Diploma in Dental Implantology and a Diploma in Aesthetic Dentistry. She also did a Masters in English Literature. She worked as Senior Consultant at Max Super Speciality Hospital. After working as dentist for various firms, she started her own clinic by the name Aesthetika Premium Dental Care where she is an Aesthetic Dentist. "After completing Bachelors in Dental Sciences, I went on to do PG Diploma in Clinical Research & Data Management. I also hold a Diploma in Dental Implantology and a Diploma in Aesthetic Dentistry. I have also done a Masters in English Literature. I worked as Senior Consultant at Max Super Speciality Hospital. After working as dentist for various firms, I started my own clinic by the name Aesthetika Premium Dental Care where I am an Aesthetic Dentist."